Non-glare tabletop tents and seminar signs provide the perfect centerpiece for friendly introductions at seminars, conferences and special events. 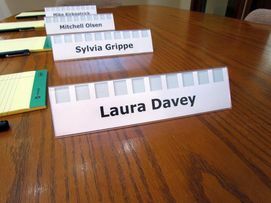 These SNAP printable name tents and seminar signs stack naturally for easy transport or storage. Just change the paper insert panel and reuse these name tents at your next seminar. Introduce your seminar participants to one another with these dual-faced, reusable tabletop tents that were voted most "able"...stackable, portable and, of course, reusable. Our goal at Scott Machine is to get to know you...and your business...even better. If you're in the area, we're always eager to sit down and talk about your seminar name tags and tabletop tents, face to face. Just name your time...we have the place. And some pretty good refreshments too! 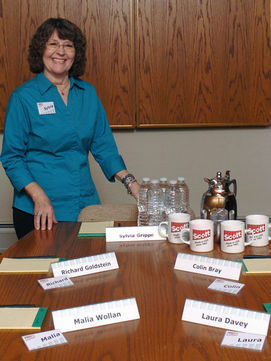 Turn your important meetings and seminars into friendly get-acquainted sessions that increase the power of your message, with reusable seminar name tags, printable name tents and changeable seminar signs.